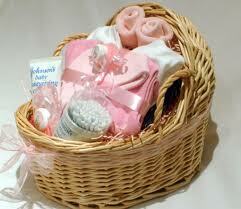 Deciding on and making your own new baby gift is always special to do and much appreciated by the receiver of it. But finding something a little bit different to put your gifts into isn't always that easy. Well this is where we can help you, as here you will find a lovely collection of high quality baby gift baskets that are simply perfect to fill with baby and new mum gifts of your choice to give when the new little bundle of joy arrives. We supply our gift baskets with cellophane so you can wrap the baskets once filled. Then why not choose some of our personalised ribbon in the colour and with the message of your choice to add the finishing touch and make the gift really extra special.